We aren’t alone in benefiting from massage. 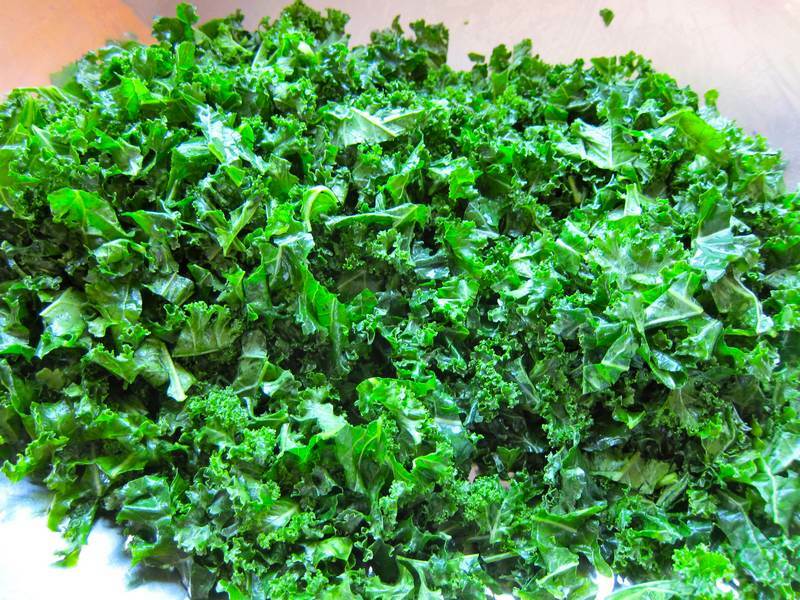 Kale transforms from stiff and fibrous to pliable and delicious after several minutes of vigorous kneading. It can be kneaded before or after adding the salad dressing. I prefer kneading it before. This salad makes a perfect vegetarian meal for 4 or side dish for 8. 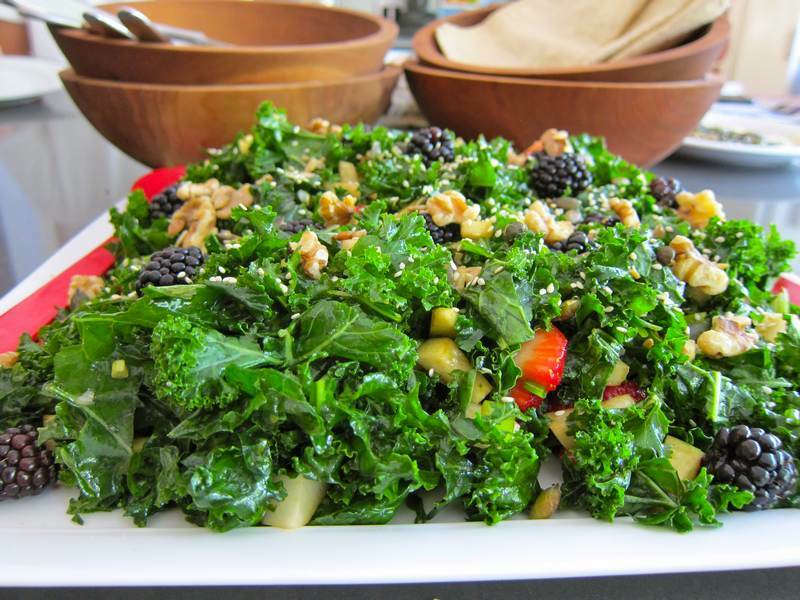 Massage or knead the kale in a large bowl to soften the leaves. Remove any tough parts of the ribs that you may have overlooked. 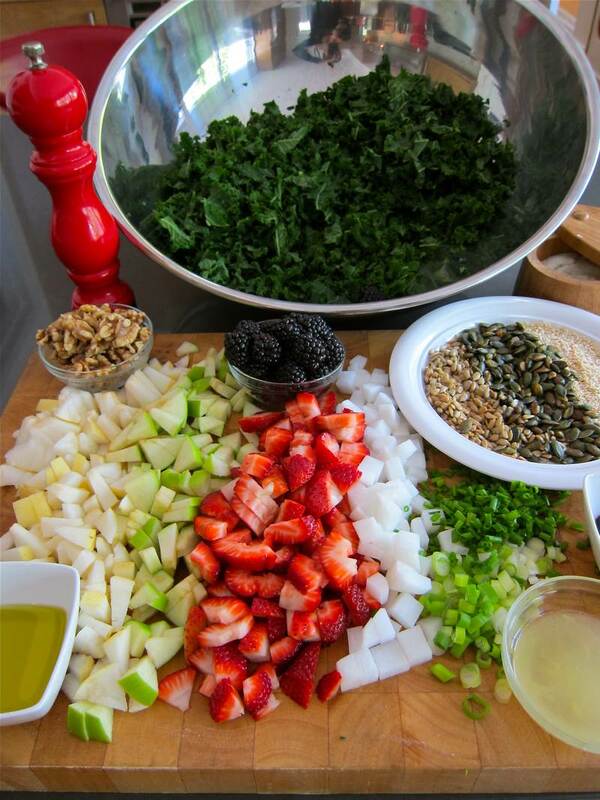 Mix the kale with the dressing and refrigerate for several hours. Add the apple, Asian pear, daikon, scallions, strawberries and chives. Taste test for correct quantities of oil, vinegar, salt and pepper. Scatter blackberries, nuts and seeds on top, before serving. 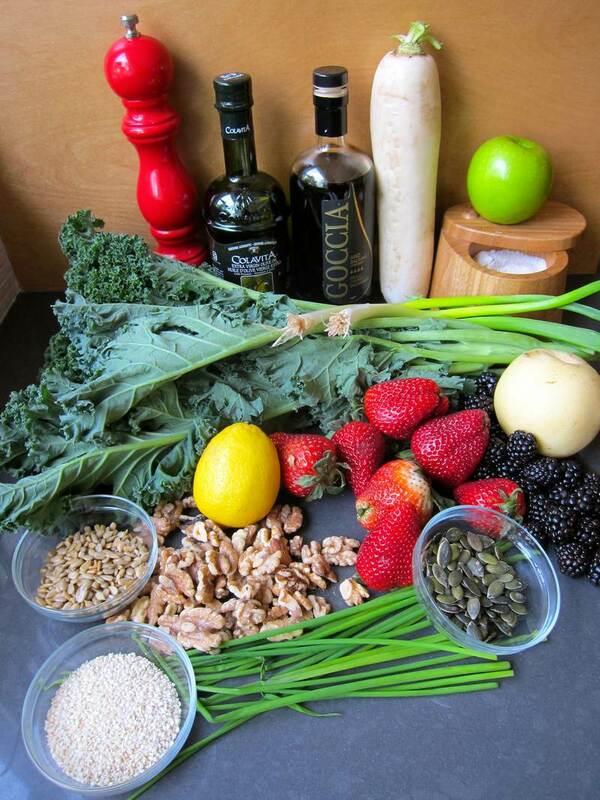 This salad was inspired by Harriet Sugar Miller‘s Kale and Blueberry Salad posted on Eat and Beat Cancer. 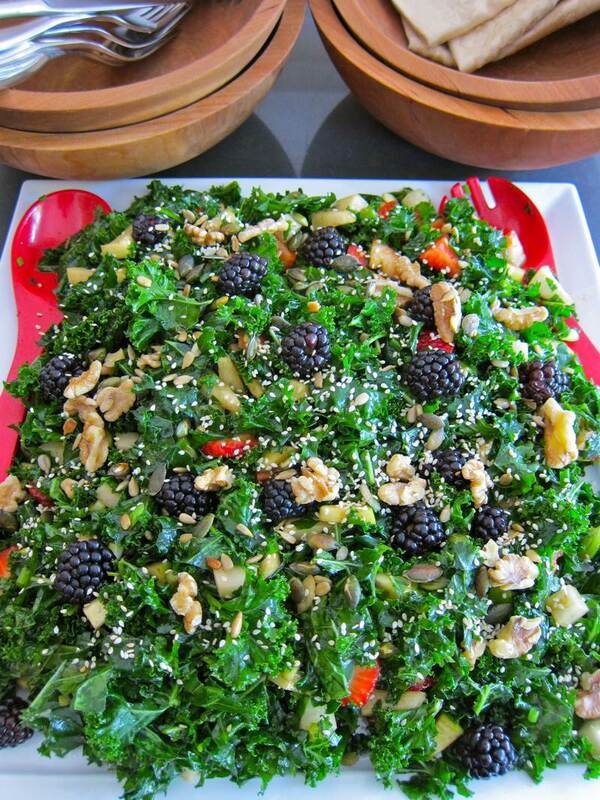 The Kale Salad was a hit at my dear friend Sheryl Shuchat‘s birthday party! The nutritional benefits of kale may convince you to try it even if you’ve always considered it tantamount to eating decorative savoy cabbage. It does seem to be one of the superfoods in the leafy green category. Betcha you’ll want to eat all of this after your first bite! I wholeheartedly agree. I sampled Holly’s beautiful salad last night and it was superb. Happy Birthday Sheryl. It’s great celebrating with friends. Thanks for having a “print ready” format. Welcome! This is one you’ll want to print and keep. What a feast! The blackberries sound so good in there. Juicy! Thanks for this recipe! I have kale growing this year in my vegetable bed – was not quite sure what I was going to do with it all. Now if you could just post some recipes using radishes, arugula, swiss chard, chives, cilantro and cucumbers I will be in business! You supply me with some of your produce and I’ll create recipes so that you can use up the rest. Deal? Thanks! Great flavour. Don’t hesitate to try. Can’t seem to stop making salads these days! My first post at “The Jittery Cook” after stealthily enjoying this blog for quite some time! 🙂 Wow, does kneading the kale really work? Never heard of it before. I assume it’s like kneading bread, just dive in and grab handfuls, is that right? BTW, thanks for providing the printer-friendly option for your recipes – it really makes a difference! So glad you like the printer friendly recipes! Kneading the kale really does help. Crush away!